Plum Granny Farm Weekly Update -- Welcome Spring! Posted 3/24/2017 7:49pm by Cheryl. The calendar announced the beginning of Spring on Monday and we are ready to see it! Now if it will only stay with us a while. We are getting a bit weary of taking the field blanket on and off the strawberries (just took it off again this morning!). Our transplants are saying they want to get in the ground but our heads kept saying that we needed to wait a bit. Based on the forecasts for the next week, we are out of the woods in terms of low temps for a while(?) Let the planting begin!!! But before plants go in, fields must be prepped. Ray has been working on tilling the fields and getting the fertilizer incorporated. We were able to borrow a bedshaper from NC A&T which lets us form the bed, lay the irrigation tape and cover the bed in plastic (or not) in one step. This will help us speed up the process of getting the fields ready for planting. We are still spending a lot of time in the greenhouse. Cheryl has been a tomato transplant tornado this week -- over 1,200 seedlings are now in larger containers where they can stretch out their roots and g-r-o-w! And the really exciting greenhouse news is that the hose trolley is now complete! No more kinked hose on the floor and wrestling with winding up the hose! Hooray! Part of this project has included plumbing so that we could add a water treatment method for our irrigation water. We have known for a while that our well water had a pH that was too high for our plants. It has taken a lot of research to figure out how to correct this problem and then it was a matter of finding the time to make it happen. Ray's plumbing skills (and about 25 trips to Lowes Depot) have really been put to the test -- but the results are terrific! Now we just have to work on getting the pH corrected -- we are using food grade citric acid to lower the pH. In an organic system, we don't have as many options as conventional growers. And of course, citric acid is more expensive than their chemical choices! We are always amazed at how much it costs to be Certified Organic. The most exciting news of the week is that the first of our caterpillar tunnels is up! We've been working on getting the site prepared (measuring, putting down landscape fabric on the edges and adding leaf compost to the soil). Today the bows went up and, despite the wind, we were able to get it covered. It's going to be a fine spot for crops -- first in will be lettuce and other greens. Hip, hip hooray! Now we have to find a proper name for the tunnel -- we are thinking caterpillar or butterfly types...any suggestions? Check out the pictures! Thanks so much to those of you who have registered for our class next Saturday. The workshop is now full! Stay tuned for more workshop opportunities soon -- we'll be doing a small fruit growing class in May. Only 5 memberships left for PlumFresh!! And we are filling things up left and right around here! Just a few more slots left for PlumFresh! If you've been thinking about it but just haven't gotten your application in, NOW is time! For more information and an application, please click here. That's it for now! Gotta go plant some stuff! And rescue Ray's coat from Detroit. Posted 2/18/2017 5:33pm by Cheryl. Ah, March Madness! The highs and the lows! The pounding heartbeat. The excitement and the despair. The ups and the downs -- always running. Oh yeah, there's that basketball thing going on too! The March Madness that we are dealing with is the crazy weather teamed with an insanely long list of things to do. Our to-do list is complicated by the swings in the weather. We go from planting transplants to covering strawberries in a matter of days. From a high of 74 yesterday to predicted lows of 21 for Wednesday and Thursday, we are scrambling to once again winterize everything. Oh well, Spring is less than 2 weeks away! Despite the weather, there's a long list of things on our to-do list and we are getting some things done! Seeding continues in the greenhouse. We are getting ready for our own planting as well as for our Open Greenhouse Plant Sales on April 23 and April 30. We'll have more than 30 varieties of tomatoes (lots of heirloom and hard to find varieties) plus peppers, herbs and lots more. We've been pruning grapes and the apple trees and the onions will getting a haircut as well. The asparagus is nicely weeded (no more spears yet) and the shallots are clear of weeds too! Yesterday we unloaded the parts for 2 new high tunnels that we'll be building soon. These high tunnels are not as structured as Raz House but they will be great for a wide variety of crops including tomatoes and possibly strawberries next year. Stay tuned to see the construction! Cheryl got to spend part of this week at the Women in Agritourism conference. This conference was sponsored by NC State University. It was great to connect with about 50 other women from across the state who are inviting people to their farms -- there are so many great venues out there! Our last shipment of ginger and turmeric came in from Hawaii yesterday! The rhizomes are beautiful! We'll now be cutting them into seed pieces for pre-sprout. If you'd like to grow some for yourself, don't forget about our workshop on Saturday, April 1 from 1-4 to give you the basics of how to grow ginger and turmeric. This hands-on class will give you the opportunity to plant your own ginger and turmeric seed to take home and learn how to care for it. The class size is limited to 15 people. The registration fee is $35. Click here for a registration form. Cucumber Update! These plants are amazing! They seem to grow about 3 inches every day. Jack might have met his match with these -- faster than a bean stalk! We may have cukes in a few weeks. And if you'd like to get in on some of these cucumbers (and our other crops), check out PlumFresh, our Harvest Subscription program. PlumFresh is different than traditional CSAs -- no big up-front payments and it is completely flexible. There's no requirement to get a box every week and we'll even deliver. Each week there are 7-9 items in the box. We have filled 2/3 of our available slots -- so if you are thinking about signing up, better do it soon! Click here for more information. This weekend will be a Full Moon. On Sunday, at 10:54 a.m., the Full Worm Moon will rise. This name was given by the Native Americans because at this time of year, the ground begins to soften and earthworm casts reappear, inviting the return of robins. This is also known as the Sap Moon, as it marks the time when maple sap begins to flow and the annual tapping of maple trees begins. That's it for now! Don't forget to Spring Forward on Sunday (before the Full Moon!) as Daylight Savings Time begins. Plum Granny Farm Weekly Update -- Coming Attractions! Posted 2/3/2017 7:32am by Cheryl. Oh well, we best get over our disbelief regarding the passage of time and get to work!. And that's what we have been doing. We've been taking advantage of these nice days to get a lot of work done at the greenhouse. There are several projects on the Greenhouse To-Do list but one of the most important is to replace the rotten baseboards along its length. As a structure, greenhouses are difficult to manage. They bear the brunt of everything the elements can throw at them -- snow, sleet, wind, hail, rain, intense sun. And by nature, they are warm, moist places -- the kind of place that plants want to live! This continuous moisture creates trouble for things like baseboards -- wood doesn't like to be perpetually wet. In most situations like that, there is a solution: pressure treated wood. However, on an Organic farm, we cannot use pressure treated wood where it touches the soil or plants or it could contaminate our veggie beds. Think about the chemicals in pressure treated wood....not exactly chemicals that you would want to find at an organic farm -- or any farm for that matter -- although many do use it! When our greenhouse was constructed in 2011, we used baseboards that had been sealed with linseed oil. Nice idea in some applications but unfortunately, the baseboards started rotting several years ago. So this time, Ray came up with a solution that allowed us to use as little pressure-treated wood as possible while maintaining a strong base for the structure. Using metal conduit and recycled billboard fabric, Ray and Chris were able to fashion an elegant solution that keeps the the treated wood well off the ground and still does the job! The greenhouse has also been a very busy place for seeding! Nearly 6,200 onions, 1,400 leeks, artichokes, cucumbers, herbs, blackberry and black raspberry plants and more now fill a large portion of the benches in the cozy "Inner Sanctum." We told you there would be a lot more seed trays when you saw this space again! We've also been out of the greenhouse too! Chris and Ray worked on the initial grape pruning last week and Ray got a chance to visit the bees. We are happy to report that all of the hives are looking good and that the girls are already harvesting nectar (maybe from the early bloom of dandelions). One of my joys of the new year is to take the brand-spanking new calendar and put all of our plans and special days on it. Now we have several special days for you to add to your calendar! We've planned at least NINE on-farm activities for 2017 -- in addition to our Pick-Your-Own events! We hear from so many of you how special it is to come to the farm. Experiences such as these create lasting memories for you and your family! We are offering more classes, an additional day for our HUGE plant sale as well as our popular Farm Tour. Make 2017 the year to visit Plum Granny Farm! October 22 Pumpkin PYO Plus! So we are very excited about all of the opportunities to host you here at the farm! We love having you come out to see where and how your food is grown. Next week we'll tell you about some other plans that we have in store for you -- so stay tuned! If you enjoy football, hope you have a great Superbowl Sunday -- and if you are not football fan, it's a great day to curl up with a book! P.S. Rejoice! Spring is less than 6 weeks away! Plum Granny Farm Weekly Update -- Happy New Year! Posted 1/14/2017 11:02am by Cheryl. Hello Farm Friends! Happy Saturday! Happy New Year from Brix -- and from us too! We hope your Holiday Season was delightful and that 2017 is off to a great start! Here at Plum Granny Farm, we are looking ahead at the season, making our plans and dreaming our dreams. Unfortunately one of the humans here had a rocky start to the year with a flu that morphed into pneumonia but antibiotics are working their magic and hopefully we'll be full-steam ahead soon! The beautiful icicles on the porch kept growing and growing (almost touching the porch floor) and tried to hold on as long as possible but they finally gave up on Wednesday afternoon. But while the snow was short-lived, Ray decided to take advantage of it with a quick ski. The conditions were perfect powder -- much like the great snow we'd get when we lived in New Mexico. Although no turns were earned on the outing, it was a great chance to see the farm under the beautiful 8" blanket of fluff. Since the snow was fluffy, we hoped that it would provide insulation and protection to the greens in the field that weren't covered. A thick layer of light snow is so much better than an icy, sleety slush for plants (and all else!) The strawberries had their winter blanket but we weren't able to cover the greens. The snow did its magic. We just checked the kale, collards and other greens and we are happy to report that they look (and taste!) great! Only one thing on the farm didn't make it --the water hydrant at Raz House blew (we had opened up the sides to let the frigid air in to help with our process of cleaning out the high tunnel). But Ray had an excellent helper as he replaced the hydrant. That pretty much wraps things up here at the farm. We've missed being in touch and hearing from you -- but we are back on track for our weekly communiques! And it's time to get back the seed catalogs and spreadsheets for planning! There are lots of special days to celebrate over the next several days starting with "Dress Up Your Pet Day" today to "Ditch New Year's Resolutions Day" on Tuesday. More importantly, let's celebrate the life of Dr. Martin Luther King, Jr. on Monday and honor his memory by doing something to make a difference in the lives of our neighbors. Plum Granny Farm Weekly Update -- May Your Days Be Garlicky and Bright! Posted 12/20/2016 8:03am by Cheryl. Hello Farm Friends! Happy Tuesday! Don't worry -- you didn't sleep through an entire week of Holiday preparations (even though you might want to!) Our days are a bit turned around. But isn't that what the Holidays do to one's schedule? Or maybe we just got distracted by some rather incredible sunsets! So what's been happening on the farm, you might ask? Lots! As we move into the true beginning of winter, there is still a bunch on our to-do list. On Thursday, we got the rest of the fresh garlic, spring garlic and shallots planted in the old raspberry beds (don't worry -- we will be planting berries in these beds after we harvest the garlic in the spring!) We ran out of space in the Bee field and these beds were just too tempting to pass up. All it took was a quick pass with the Grillo to make them nice and fluffy. And since we always count things around here, our garlic grand total is 18,566 - more or less. And here's Chris the Planting Machine tucking in those last cloves of spring garlic - Chris, thank you SO much for all of your planting skill and hard work! Whew! With that major milestone behind us, it was time to move on to a few other projects. Since we were in the swing of planting bulbs, it seemed to be a natural extension for Cheryl to plant two beds of tulips and daffodils in the Demo Garden -- expect a riot of color this spring! Spotted: Santa's Helpers in Purple Hats! We've been busy shipping gifts A-L-L over the country this week and would love to help you with your last-minute gifts! Share your love of local food with friends and family near and far...without leaving your house! Our jams, garlic braids and gift boxes are ready for giving and are perfect as a hostess gift, a teacher, or even for yourself! Check out our online store and see what we have to offer -- we've just restocked our Raspberry-Baby Ginger Jam! Looking for a custom option? Give us a call (336-994-2517) or send us an email (farm@plumgrannyfarm.com) and we can put something together for you! We'll be happy to take care of shipping (along with our friends at USPS) -- but better hurry! As we move towards the shortest day of the year, it is time to slow down a bit and take some rest. Maybe we need to take a few lessons from Gesti who always finds that perfect ray of sunshine for her nap spot. Or Detroit, who can make even a pile of garlic stems seem like the perfect pillow (just like his brother, Ajo). This is our last Weekly Update for the year -- we're taking a few days off to relax over the Holidays (our animals model such good behavior and try to teach us some lessons!) We appreciate you reading this newsletter and passing it along to your friends. We are so thankful of your support of our farm and your interest in what we are doing. Your comments about these newsletters and our products really help us do what we do. We cherish your words of support and encouragement as well as your business! And most of all, we are most grateful for your friendship and trust. Here's wishing you the most wonderful Holiday Season ever! Joyous Solstice, Happy Hanukkah, Merry Christmas and all good wishes for a Happy & Healthy New Year!! Plum Granny Farm Weekly Update -- Brrrrr! Posted 12/9/2016 12:58pm by Cheryl Ferguson. Even though Winter's official arrival is 12 days away, the temperatures didn't seem to get the email -- it's cold out there! The morning temperature was 28 degrees -- and it will be colder tomorrow. And I'll remember to turn the faucet off. Ray and Chris worked on getting things winter-ready on Wednesday (covering wells and draining water lines) and yesterday morning, the strawberries put on their winter coat. They seemed to appreciate it this morning! Much of the week was spent in pulling together files and records for our organic inspection. Because of Tuesday's rain, we rescheduled it for yesterday -- a much better day to walk all over the farm. From the inspector's comments, it seems that everything was fine and that we passed. We'll be getting their final determination in a month or so. The on-site inspection is very thorough and involves a complete farm walk as well as reviewing our documentation -- half a day at least. One of the parts that we have to be prepared for is to show our all crops from seed to sale -- a complete audit of when we seeded, when and how much was planted, what was harvested and how much we sold. For the newer readers of our newsletter, you may ask, "why do you do this?" Great question. We believe it provides an important assurance to our customers regarding how we grow our crops. Unlike vague terms like "naturally grown" or "no spray", what we produce is regulated through an extensive Federal certification process. From the seed we plant to our tent at market, we have specific requirements that we must meet to ensure that the food you enjoy from us is grown in a way that nourishes the land (and you!). We deeply appreciate your trust in us and thank you for supporting a Certified Organic farm! With the inspection behind us, we can now breathe a little bit. We are trying to get in the Holiday Spirit by doing some special things. We took a break last Sunday afternoon to go to Mitchell's Greenhouse and Nursery in King for their annual Poinsettia Open House. They are the largest grower of poinsettias in the Triad (over 9,000!) and grow 81 varieties. Because of their prolific poinsettia passion, they are one of 33 greenhouses in the U.S and Canada to participate in the North American Poinsettia Trials. Go check them out -- they still have beautiful flowers for your home or office! This week, we hope to move our Christmas tree from the greenhouse (where it has been since the Holiday Market) to the living room and deck the farm sign with our traditional purple lights! It's so much fun getting in the spirit! And, yes, it's time to take a nap or two. Brix recommends it highly. Need a few more gifts? Don't head out to the Big Boxes! We make it easy to shop local without leaving your house! Our jams, garlic braids and gift boxes are ready for giving and are perfect as a hostess gift, a teacher, or even for yourself! Looking for a custom option? Give us a call (336-994-2517) or send us an email (farm@plumgrannyfarm.com) and we can put something together for you! We'll even take care of the hassle of shipping them! Check out our updated online store and see what we have to offer. And we'll leave you with a mystery... sort of. Our dear little black lamb, BB, has a secret. She's not really black... she's GREY! It really is a weird thing! She started getting lighter and lighter after she was sheared but now she is getting really grey! We've heard that some black sheep turn grey or even white as they age because of genetic factors. We suspect it might be Big Brother Tony that is causing those darn grey hairs! What do you think? Should we change her name to GB (Grey Beauty)? Plum Granny Farm Weekly Update -- Welcome December! Posted 12/2/2016 1:07pm by Cheryl Ferguson. Rain, glorious rain! Yes, we finally got some desperately needed moisture this week. A nice rain over a couple days -- .8 will help our garlic and other overwintered crops immensely! And thanks to your generosity, Mount Olive Elementary raised $610 for its Lion's Den! That's a lot of okra ornaments!! Thank you so much for your support of this important program! Also a special thanks to Amanda Dodson of The Stokes News for writing a wonderful article on the event. Check it out! After trying to put things back together after the Holiday Market, we've been plowing through other things on our to-do list. Planting garlic is one of the top priorities and we have over 8,000 cloves in the ground. Yay to Chris for getting most of them planted! We've been stuck inside getting things ready for our annual Organic Inspection next week. Chris is THE. BEST. GARLIC. PLANTER. EVER! Conditions are great for the garlic to begin to sprout -- and that's what they are doing. Here's the Georgian Crystal garlic that was planted last Wednesday. We'll be sowing cover crop in the house to build up more nutrients and help prevent disease in the soil. We want to give it a break from production mode this coming year. Plum Granny Elves are at Your Service! If you looking for gifts for the foodie on your list, something edible is always a great choice. Our jams, garlic braids and gift boxes are ready for giving! We'll even take care of the hassle of shipping them! Check out our updated online store and see what we have to offer. A gift from Plum Granny Farm is always in good taste! Guess we had better sign off and get back to working on our Organic Growers Plan! Keep your fingers crossed for us! Posted 11/22/2016 8:58am by Cheryl Ferguson. Since many of you receive your newsletter at work, we wanted to make sure that you got all of the news before you head out for your Thanksgiving holiday. Honest, we aren't trying to confuse you! What a busy week it's been already. We're trying to do the juggle of getting real farm progress made (can you say garlic?) with getting things ready for Saturday's Small Business Saturday Holiday Market! Clearing and rearranging the greenhouse, putting seed trays in their new storage area, harvesting vegetables and turmeric, making jam -- the week has a very packed to-do list. Before we dive into a sneak peek at our Small Business Saturday event, we wanted to pause for a moment to say a heart-felt Thank You! Thanks for being a part of the Plum Granny Farm family. Together we’re building a community that shares a passion for sustainable, organic agriculture and together, we CAN make a difference in our food system. Thank you for standing with us in good times (huge turnout for Farm Tour) and in tough times (losing most of our strawberry crop due to hail). Happy Thanksgiving from our family to yours. Bunny's Trees will provide fresh Fraser Fir Christmas trees along with beautiful handcrafted wreaths and fresh white pine roping perfect for decking the hall! Get started on your Holiday decorating here! Greenberries Farm makes creative and useful items out of recycled items. They will have recycled wine box/cork birdhouses, wine cork ornaments, reclaimed barnwood coasters, and coloring book totes. You are sure to find a perfect gift among their offerings! KanoKano Studio will bring a brand new batch of one-of-a-kind jewelry created in Winston-Salem. Their signature wire-wrapped jewelry with subtle accents will make great holiday gifts! La Vie en Rose Food Truck will provide a taste of France for your lunch and snacking pleasure! They are known for their incredible crepes and authentic French food -- rave reviews everywhere they go! This year you won't have to shop hungry! Mount Olive Elementary School is bringing adorable Santa ornaments that are handmade from okra. Every child at Mount Olive (300 K-5 students!) painted one of these ornaments and they were decorated by faculty, staff, volunteers and older students! The Student Council will be selling these as a fundraiser for the Lion's Den program at the school. In addition, children and adults alike can make their own Santa Angel ornament on-site! Mystic Wolf's Den (formerly MW Herbs) will be bringing handmade soaps, pain relief and healing salve, and soy melts. New this year are bath bombs, including the "soothing skin" version with aloe, goat's milk, honey, oatmeal, cocoa butter, & coconut oil infused with chamomile & calendula. Truffles NC will be bringing three delicious products to the market: Pure creamery butter with black winter truffles, sea salt with black winter truffles and creamed clover honey with -- you guessed it-- black winter truffles. All natural truffle products. Never flavored. 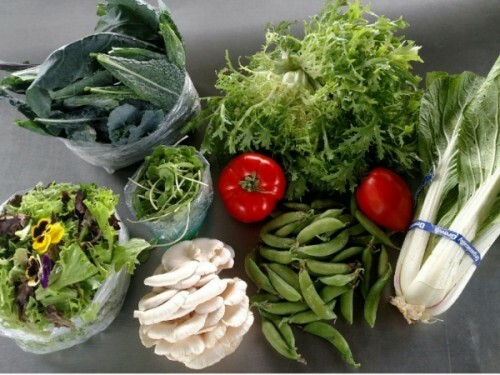 Since we know you also need to eat, we'll have lots of fresh veggies including fresh Baby Turmeric and Baby Ginger, Swiss Chard, Powdered Turmeric, Powdered Ginger, Garlic Powder & Granules and Garlic Sampler bags and several varieties of Culinary Garlic. There will also be Fresh & Roasted Ancho Chile, Pac Choy, Sunflower Shoots, Pea Shoots and hopefully a few tomatoes -- all Certified Organic! This is our last event for 2016. Help us make it a great day! And don't forget that our friends at Buffalo Creek Farm and Creamery in Germanton has teamed up with us for a simultaneous event! They have 12 vendors with a wide array of products! It's a pleasant 20-minute drive between the two farms. Come shop small, ya'll! Wishing you a wonderful Thanksgiving with your family and friends. We have many blessings to count as we begin to close out 2016 - and you are among them. Posted 11/18/2016 9:11am by Cheryl Ferguson. Busy, busy week! Garlic has been on our mind (and hands!) a lot this week as we move through our planting plan. We've had to crack a lot of garlic to get it ready to plant. Then it's just a matter of getting out in the field and planting! What is really strange this year is how dry it is. We have actually had to irrigate the field to get it wet enough to be able to plant. A far cry from last year when we had to wait until the field dried out. Here are some scenes from planting last Friday with our friends from Siler City as well as Chris and Ray planting yesterday. Our Holiday Market is just 1 Week Away! Wouldn't you love to make one of these lovely Okra Angels? Or maybe take a Santa Okra home for your tree? You'll be able to do this and find MUCH more at our 3rd Annual Small Business Saturday Holiday Market on Saturday, November 26 (10-3)! We have a great line-up of vendors with wonderful local products -- stay tuned for an email on Tuesday that will feature more information about our vendors and what they are bringing. If you want a sneak preview, check out our Facebook event page that also provides more details. And don't forget our friends at Buffalo Creek Farm and Creamery -- we are partnering with this to host this great day. Shop Small Ya'll! Yes, that sad day is upon us. Saturday will be the last day of the Cobblestone Farmers Market in Old Salem! But it is going to be a great one! We'll be there tomorrow with lots of Certified Organic tastiness to keep your Thanksgiving tastebuds happy! Here's what you'll find on our table: Bubba Blue and Hawaiian Yellow Baby Ginger, some Baby Turmeric, Tomatoes, Swiss Chard, Ancho Chile Pepper (fresh and Fire-Roasted) and herb bunches for your Thanksgiving cooking (Rosemary, Garlic Chives and Oregano). In the Garlic Department you'll find: Garlic Powder and Granules (Purple Italian and Lorz Italian), Garlic Sampler Bags, bulb Garlic (this week's feature is the heirloom Inchelium Red, an Ark of Taste variety, plus we'll have 5 other varieties), and Garlic Braids. And don't forget the Garlic Scape Pesto -- this could have a nice role in your Thanksgiving feast! Last week for Seed Garlic! We have Lahontan Early (softneck) and Georgian Crystal (hardneck) remaining. If you've ever wanted to grow garlic at home, let us help! And did I say JAM? Yes, we've been jamming this week and it's back! Just in time for the Holidays, we'll have several of our yummy raspberry jams on the table! This week we'll have Old Fashioned Raspberry, Raspberry-Baby Ginger and Raspberry Cranberry. They are available in regular and gift-size jars. And we will even have that seasonal favorite, Mistletoe! It's tested and guaranteed to work! ;-) As Ray says, "This stuff is so good that even a nerd like me can get a kiss!" If you'd like us to save something for you, please send us an email by 10 p.m. prior to market. In the spirit of Thanksgiving, we want to let you know how thankful we are to you for your business, your encouragement, your cheerfulness and your friendship. We could not do this thing we call Plum Granny Farm without you -- and we are most grateful. Plum Granny Farm Weekly Update -- Garlic Galore! Posted 11/11/2016 7:14am by Cheryl Ferguson. Today is Veteran's Day. It's an important day for our nation that is about more than a day off work or school and big sales at stores. Veteran's Day honors all members of the Armed Forces who served this country. They served and fought to protect us, to keep our country safe, and to preserve our way of life. Veterans gave their time, and risked their lives for you and me. In some cases, they made the ultimate sacrifice. Please take a moment to remember our veterans and say a word of thanks. Both Ray and Cheryl's fathers were part of the Greatest Generation, serving their country during World War II. We owe a huge debt of gratitude to all of our veterans. Thank you for your service! It's garlic planting time! Today we will start planting garlic -- hooray! The field is ready -- the beds are nicely shaped and the irrigation lines have been laid out. And much of the garlic has been cracked and is ready to go into the ground. And our dear friends Susan and Howard and their family are coming up from Siler City to help! What great friends! We are very excited to be planting. The past few years we have been slowed down by a lot of rain right when we want (and need) to plant. Well, this year's drought is taking care of that! We'll be planting about 18,000 cloves this year plus about 12,000 cloves for spring garlic. This is a far cry from what we started on Thanksgiving weekend 2007 when we planted our first cloves in the little bed by the barn (aka the Test Bed). Ray, Cheryl and Mike Sprinkle planted about 2 pounds of cloves -- took us about 15 minutes to crack it. Now our porch is filled with crates of seed garlic and there's still more in the barn! I guess we liked growing it! We'll see if RingBob gets into the act of planting this year. His predecessor, Wally, was always ready to jump in to supervise whatever planting tasks we had. Ummm, I think RingBob will probably have a wait a year! Just 2 weeks Away! Holiday Market! Don't forget to mark your calendar for Saturday, November 26 (10-3) for our 3rd Annual Small Business Saturday Holiday Market here at the farm! Pick up a flyer at Cobblestone Farmers Market (or several places around town) -- it has the full list of participants. Between us and Buffalo Creek Farm and Creamery, we have more than twenty vendors! You'll be able to take care of your Holiday shopping needs LOCALLY! All kinds of items will be available from goat cheese to truffle butter, from jewelry to baskets, from jams to garlic gift boxes, from Christmas trees to fresh pine wreaths and roping. Don't forget -- Shop Small! We are in the final stretch for Cobblestone Farmers Market in Old Salem! This week and next week are the LAST two markets of the year. We'll be there tomorrow with lots of Certified Organic tastiness! A special treat will be our Fire Roasted Ancho Chile Peppers! Here's what else you'll find on our tables: Bubba Blue Baby Ginger, some Tomatoes, Tomatillo Salsa Kits and Green Beans. And of course there's all things garlic: Garlic Powder and Granules (Purple Italian and Lorz Italian), Garlic Sampler Bags, bulb Garlic (this week's feature is German Red and we'll have 5 other varieties), and Garlic Braids. And don't forget the Garlic Scape Pesto -- this could have a nice role in your Thanksgiving feast! If YOU want to plant garlic, you'd better hurry to get your bags of Seed Garlic -- this is our biggest garlic that we save for planting (bigger cloves yield bigger garlic). If you've ever wanted to grow garlic at home, let us help! We even have home-sized bags of soil amendments available. Enjoy these sunny warm days while they last -- the bees are trying to squeeze out every drop of sunshine!